Fletcher in the 2013 NFL season. London Levi Fletcher (born May 19, 1975) is a former American football linebacker who played in the National Football League (NFL). He played college football at John Carroll, and signed with the St. Louis Rams as an undrafted free agent in 1998. Fletcher also played for the Buffalo Bills and Washington Redskins. Fletcher was well known for never missing a game in his career, being one of only four players in NFL history to play in over 250 consecutive games. Fletcher also holds the record for consecutive starts at the linebacker position. He eventually finished his career with 215 consecutive games started, which ties him for 6th all time along with Alan Page and Ronde Barber. Fletcher attended Villa Angela-St. Joseph High School in Cleveland, Ohio, and won varsity letters in football and basketball. He played on two state championship basketball teams. While attending John Carroll University, Fletcher played both basketball and football for the John Carroll Blue Streaks. As a senior, he had 202 tackles (a school-record) and was named the Division III National Linebacker of the Year. Fletcher also attended Saint Francis University of Pennsylvania before transferring to John Carroll University. He was on the men's basketball team at Saint Francis. Fletcher signed with the St. Louis Rams as an undrafted free agent on April 28, 1998. He was one of the two rookie free agents to make Rams’ opening day roster, playing in all 16 regular season games. Fletcher earned the Rams Rookie of the Year Award. In 1999, Fletcher led the Rams in tackles after winning the starting middle linebacker position during training camp. His 138 tackles for the season were the most by a Ram since Roman Phifer collected 149 in the 1995 season. He also started at linebacker for the Rams in Super Bowl XXXIV, in which the Rams defeated the Titans 23-16. He also was named to the All-Madden team and as a second alternate to the Pro Bowl for the first time. In 2000, he again led the team with 193 tackles, eclipsing the old franchise mark of 185 set by LB Jim Collins in 1984. Fletcher earned NFC Defensive Player of the Week honors for the first time in his career after making 14 tackles (9 solo) and tying a career-high with two sacks against the Minnesota Vikings on November 10. He established season and career highs in sacks (5.5), interceptions (4) and quarterback pressures (9), along with a forced fumble and was again an alternate to the Pro Bowl. In 2001, Fletcher earned NFC Defensive Player of the Week honors twice and was an alternate to the pro bowl for the third straight season. In a game against the San Francisco 49ers on September 23, he led the team with a career-high 21 tackles, 15 solo. The second time was after his big performance against the New England Patriots on November 18 as he led the team with 17 tackles with one pass deflection. He forced a fumble on the Rams’ three-yard line that led to a 97-yard scoring drive to end the first half and intercepted a Tom Brady pass with 5:18 left in the third quarter for an 18-yard return. This season the Rams made the Super Bowl XXXVI but were defeated by the Patriots 20–17, after kicker Adam Vinatieri made a game-winning 48-yard field goal as time expired. Fletcher signed with the Buffalo Bills as an unrestricted free agent on March 7, 2002. In the 2002 season, his first season with the Bills, Fletcher set a career high for himself as well as a franchise record with 209 tackles, which broke the old mark of 206 set by Chris Spielman in 1996. He also was selected as a Pro Bowl alternate eight times though he never was actually a Pro Bowler as a Bill even though in 2002 he was a second alternate to the game. Since 2002, Fletcher started all 16 regular season games for the Bills until his last season in 2006, when he recorded a team-high 157 tackles, including nine for loss, set a career high with 14 deflections and tied a career high with four interceptions. On September 10, in the first regular season game, Fletcher scored his first career touchdown after recovering a fumble by the Patriots' Tom Brady and returning it five yards for a touchdown only 12 seconds into the game. Fletcher was named a 2007 Pro Bowl alternate in his last season as a Bill. Fletcher (#59) pursuing Vernand Morency with Rocky McIntosh (#52) in 2007 season. On March 2, 2007, Fletcher signed with the Washington Redskins to a five-year, $25 million contract. He immediately became the team's starting middle linebacker. With his first season on the team, he was named co-winner of the B.J. Blanchard Award, an honor given annually to a Redskins player who best helps the local media do their jobs, along with quarterback Jason Campbell. Fletcher continued his Pro Bowl-caliber run with the Redskins in 2008. He was the Redskins' defensive co-captain for the team from 2008 season until he retired. Also in 2008, the Redskins nominated Fletcher as their Walter Payton Man of the Year Award representative. Fletcher was named to the NFC squad in the 2010 Pro Bowl after Jonathan Vilma's New Orleans Saints qualified for Super Bowl XLIV, the first Pro Bowl selection in his career. Fletcher was also one of three candidates for the 2009 Walter Payton Man of the Year Award, which was ultimately won by the Kansas City Chiefs's Brian Waters. After the Redskins' switch to a 3-4 defensive scheme, Fletcher moved from the middle linebacker position to the left inside linebacker for the 2010 season. He made the Pro Bowl for the second consecutive time in 2010, where he had an interception which set up a touchdown for the NFC. Despite not making the 2012 Pro Bowl starting roster, Fletcher led the entire league in tackles with 166 tackles by the end of the 2011 season. He started all 16 games of the 2011 season and recorded 166 combined tackles, 1.5 sacks, two interceptions, and eight pass breakups. Fletcher, however, did make it as alternate for the 2012 Pro Bowl along with teammates, Brian Orakpo and Lorenzo Alexander. On January 9, 2012, Fletcher was added to the NFC 2012 Pro Bowl roster after Brian Urlacher confirmed that he would not be participating. On January 11, 2012, it was announced that Fletcher won the Bart Starr Award. He was also named the Redskins' 2011 Defensive Player of the Year. Fletcher on the sidelines at the 2013 Pro Bowl. On April 13, 2012, Fletcher was re-signed by the Redskins to a two-year contract worth $10.75 million with $5.25 million guaranteed. He was given the 87th ranking in the NFL Network's Top 100 Players of 2012 list. Despite the Redskins' 31-28 loss to the St. Louis Rams in Week 2 of the 2012 season, Fletcher had a stellar performance. 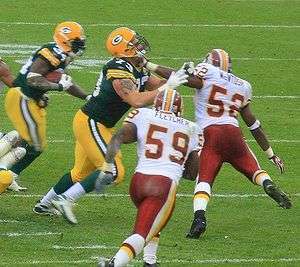 In the game, he intercepted quarterback Sam Bradford in the endzone and forced running back Daryl Richardson to fumble in the fourth quarter and the ball was recovered by DeAngelo Hall, which gave the Redskins its last attempt to tie or win the game. In the Week 12 win against the Dallas Cowboys on Thanksgiving, he recorded his second interception for the season making him one of three active NFL players, at that time, to have recorded 20 interceptions and 30 sacks, the other two being Brian Urlacher and Ray Lewis. Fletcher intercepted Joe Flacco in Week 14 against the Baltimore Ravens. He had another interception, against Brandon Weeden, in the Redskins' win over the Cleveland Browns. He finished the season with 139 tackles, three sacks, and a career-high five interceptions. There was doubt over whether Fletcher would return for the 2013 season until it was announced that he had surgery on his left ankle and was scheduled for elbow surgery to prepare for another season with the Redskins on March 6, 2013. On November 7, Fletcher started his 208th consecutive game, tying the league's all-time record of most starts by a linebacker last held by retired linebacker Derrick Brooks. On December 18, 2013, Fletcher announced that he was "99 percent" sure that he was going to retire after the 2013 season. Fletcher finished his career having played in 256 consecutive games and starting 215 consecutive games, which is the NFL all-time record of consecutive starts at the linebacker position. Fletcher is a Christian. Fletcher spoke about his conversion to Christianity saying, "I spent years chasing things I thought would bring me everlasting joy and happiness: chasing Super Bowl rings or a multi-million dollar contract; or a new house, cars and jewelry. None of those things did for me what Christ did in an instant." Fletcher was named a Pro Bowl alternate eleven times during his career and did not play in his first one until the 2010 Pro Bowl via replacing Jonathan Vilma. As a result, Fletcher called himself the NFL version of Susan Lucci, who won a Daytime Emmy in 1999 in her 19th attempt. ↑ Bell, Jarrett (October 24, 2012). "Balance problem puts Redskins LB London Fletcher's streak in doubt". USAToday.com. Retrieved 2012-10-28. ↑ "Reuters Good, Bad, and Ugly". October 1, 2009. ↑ Jones, Mike (January 2, 2012). "London Fletcher ends season as NFL's leading tackler". WashingtonPost.com. Retrieved 2012-01-02. ↑ Maese, Rick (December 28, 2011). "London Fletcher among Redskins' Pro Bowl alternates". WashingtonPost.com. Retrieved 2011-12-28. ↑ "London Fletcher will play in Pro Bowl". ESPN.com. Retrieved 2012-01-09. ↑ "'Skins London Fletcher nabs Bart Starr Award for character, leadership". GantDaily.com. Retrieved 2012-01-11. ↑ Jones, Mike (August 24, 2012). "Fred Davis, London Fletcher, Lorenzo Alexander named Redskins' 2011 players of the year". WashingtonPost.com. Retrieved 2012-08-24. ↑ Campbell, Rich (April 13, 2012). "Redskins retain team captain London Fletcher". WashingtonTimes.com. Retrieved 2012-04-13. ↑ "Fletcher's 'Skins deal for two years, $10.75M". NFL.com. April 16, 2012. Retrieved 2012-04-16. ↑ Tinsman, Brian (September 17, 2012). "Redskins-Rams: Week 2 Game Notes". Redskins.com. Retrieved 2012-09-17. ↑ Hamilton, Tracee (September 17, 2012). "It's official: NFL has problem with replacement refs". WashingtonPost.com. Retrieved 2012-09-17. ↑ Tinsman, Brian (November 22, 2012). "Redskins Score Texas-Sized Win, 38-31". Redskins.com. Retrieved 2012-11-22. ↑ Tinsman, Brian (December 9, 2012). "Redskins Win Thriller In Overtime, 31-28". Redskins.com. Retrieved 2012-12-10. ↑ Tinsman, Brian (December 17, 2012). "Victory Monday Stats Pack: Redskins-Browns". Redskins. Retrieved 2012-12-19. ↑ Jones, Mike (May 24, 2013). "Redskins' London Fletcher didn't seriously consider retirement". WashingtonPost.com. Retrieved 2013-05-26. ↑ Kogod, Sarah (February 20, 2013). "London Fletcher says he's still deciding whether to play next season". WashingtonPost.com. Retrieved 2013-03-09. ↑ Copeland, Kareem (March 6, 2013). "London Fletcher preps for Washington Redskins return". NFL.com. Retrieved 2013-03-09. ↑ Jones, Mike (March 6, 2013). "London Fletcher undergoes ankle surgery, eyes return next season". WashingtonPost.com. Retrieved 2013-03-09. ↑ Hiatt, Gabe (November 11, 2013). "A Look At Fletcher And Brooks". Redskins.com. Retrieved 2013-11-11. ↑ Keim, John (December 18, 2013). "London Fletcher Likely To Retire". ESPN.com. Retrieved 2014-01-01. ↑ Tinsman, Brian (December 18, 2013). "London Fletcher: 'My Work Is Done Here'". Redskins.com. Retrieved 2014-01-01. ↑ Stuart, Chase (December 28, 2013). "Fletcher Lasted Where Most Don't". NYTimes.com. Retrieved 2014-01-01. ↑ "My Story: London Fletcher". ↑ "Fletcher: 'I'm the Susan Lucci of the NFL'". ESPN.com. December 18, 2008.